All cars manufactured in the UK since 2012 have some kind of Tyre Pressure Monitoring System (TPMS) fitted, and for all cars manufactured from 2014 the Tyre Pressure Monitoring System is checked as part of the annual M.O.T. At Guyhirn Tyres we have the equipment and expertise to test, replace and re-programme TPMS Sensors. A Tyre Pressure Monitoring System is an electronic system designed to monitor the air pressure inside your tyres. The TPMS reports real-time tyre pressure information to the driver of a vehicle, either via a guage, a pictogram display or a simple low-pressure warning light. 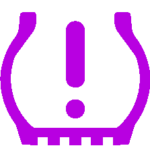 TPMS can be devided into two groups. This is where the vehicle monitors the rotation of the tyres and works on the basis that an under-inflated tyre has a slightly smaller diameter and will rotate slightly quicker. The vehicle can sense this either through the ABS (Assisted Braking System) or using spectrum analysis of the individual wheels. Indirect TPMS cannot measure or display absolute pressure values, or tell which tyre has reduced pressure. Direct TPMS employs pressure sensors on each wheel, either internally or externally. The sensors physically measure the air pressure in each tyre and report it to the vehicles instrument cluster or a corresponding monitor. Some units measure the temperature of the tyres as well. These systems can identify under-inflation in any combination, be it one tyre or all simultaneously. If your sensors are showing under-inflated tyre(s) yet you have recently put air into your tyres, contact us to get your TPMS tested and if necessary repaired.